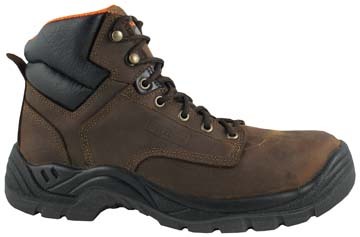 Non-Steel "Cove" hiker boot gives protection from weather elements. 6 inch top is waterproof to the 4th eyelet. Direct attach sole seals the upper distressed leather to the sole. Steel-Toe "Galloway" is made the same but is ASTM 2413-11 safety rated. Same comfy hiker in your choice of safety or not. Direct attach sole is best for keeping the water out of your socks. Moisture Wicking lining allows sweat to leave, but does not allow larger water droplets in.